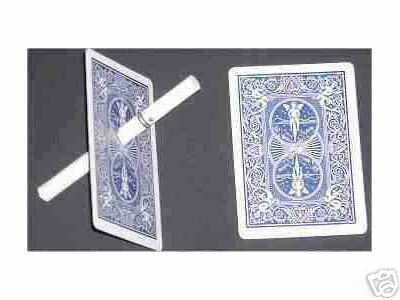 Discount Magic - Cigarette through card. A deck of cards is shuffled and a playing card is selected, the card can even be signed. A cigarette, pencil or rolled up bank note is then pushed straight through the card leaving absolutely no hole! This is the original method, not a cheap imitation, and has been hand crafted, precision cut in the USA from Bicycle Cards. With a couple of easy to do sleight of hand moves you can work this gimmicked card into your regular deck, have the deck cut, and the chosen card signed before performing this amazing effect. A must for the serious card performer. This item is best used with a blue backed Bicycle Deck. very good once u get the hang of it ive amazed friends and f ..
Cigarette through card A deck of cards is shuffled and a playing card is selected, the card can even be signed. A cigarette, pencil or rolled up bank note is then pushed straight through the card leaving absolutely no hole!